Manolo Blahnik (b. 1943), an influential and popular shoe designer, at an early age established a close relationship with the United States and its culture from reading his mother's American Vogue magazine when it arrived by mail to his home in the Canary Islands off the coast of Spain. In 1971 Blahnik came to New York after years of studying literature, architecture, and art in Paris and Geneva. His portfolio of sketches and theater set designs were seen by Vogue magazine editor Diana Vreeland, who was amused by some of his whimsical sketches. 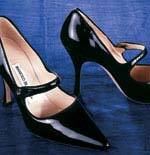 She encouraged Blahnik to design shoes.